My major professor recommended I read this book when I began writing my dissertation. I stifled a groan and hoped the small smile on my face resembled a grin and not a grimace as I nodded my head in agreement. What was going through my mind was the nightmare recollection of reading Elements of Style for high school English class. In addition to this horrible memory, I also thought I was decent (better than most, dare I say) at grammar. I grew up doing the grammar and word quizzes in the Reader's Digest . I knew that I should use "couldn't care less" instead of "could care less" and that a semicolon separated two independent but related clauses. So why would I need to read a grammar book? Needless to say, it took more than one prompting to actually check this book out of the library. But when I finally did, I was surprised to find, instead of the line after line of technical rules of how to properly punctuate and capitalize, funny anecdotal stories interspersed with easy to remember tenets of grammar. Lynne Truss does a wonderful job of keeping the book light and entertaining while dispensing valuable information of the history and proper use of punctuation and grammar. Though Truss is British, she notes where American English rules differ from British English rules. 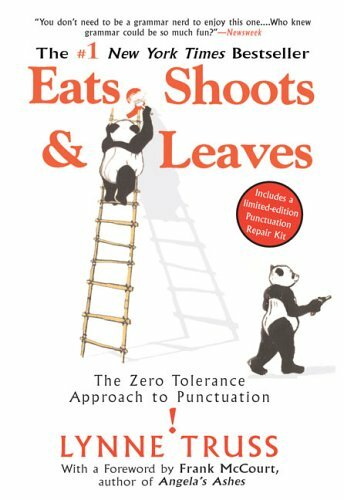 I highly recommend Eats, Shoots & Leaves to any writer (and if you are a high school English teacher have your students read this one as they will get so much more out of it).